World Wide Gum was one of several gum companies to make hockey sets for the 1933-34 season. Since they were closely associated with the U.S.-based Goudey company, 1933-34 V357 Ice Kings Hockey cards are widely sought by collectors. They are named after the brand of the gum that accompanied the cards. 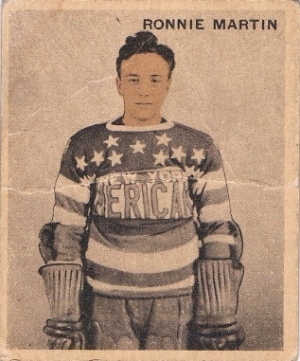 1933-34 V357 Ice Kings Hockey card fronts feature a tinted player picture, with the background ice left intact. The player's name appears in a corner and a white border surrounds the card. Backs are printed in green ink and the layout is similar to what fans of many of Goudey's sets would recognize. A card number appears at the top, followed by the player's name, position and team. There are two back formats, as cards are found in English-only or in French and English. With the bilingual back, the French translation appears first. At the bottom is an ad for both Ice Kings Gum and for the World Wide Gum Co. There are 72 cards in the 1933-34 V357 Ice Kings Hockey set. Two series were printed. The first 48 cards are more common. The last 24 are slightly harder to locate. That said, Howie Morenz, Charlie Conacher, Auriel Joliat and King Clancy are the set's key stars and all appear in the first series. 1933-34 Ice Kings V357 Martin Marty Burke RC #14 Canadiens Very Nice Rare ! 72 cards. The final 24 are short prints.